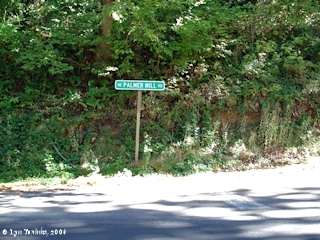 Click image to enlarge Palmer Mill Road Sign. 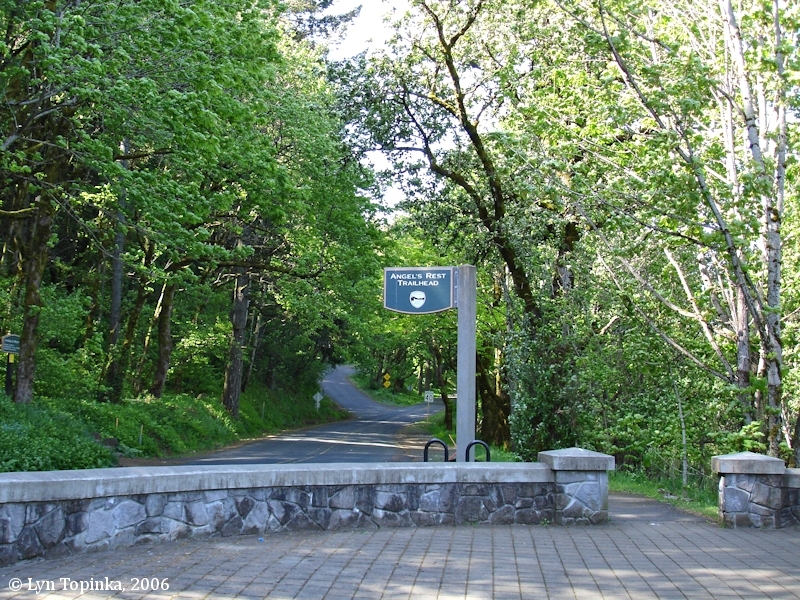 Palmer Mill Road branches off of the Historic Columbia River Highway above Bridal Veil. Image taken September 23, 2006. 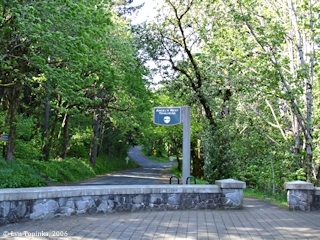 The small now-ghost-town community of Palmer, Oregon, was located in the Columbia River Gorge at Columbia River Mile (RM) 133, east and up the hill from Bridal Veil. The community was on the flanks of Larch Mountain. "... Palmer post office was in service near Bridal Veil Creek in the hills about three miles east of Bridal Veil from February 21, 1898 to December 15, 1919. Idona A. Pulley was the first postmaster. The office was near the mill and logging railroad of the Bridal Veil Lumber Company and was named for the president, Loren C. Palmer. ..."
"... Brower was the name of a post office in the hills about two miles south-southeast of Bridal Veil at the north base of Pepper Mountain. It was named for George W. Brower, who, with Eldridge H. Thompson, had a logging and lumber business thereabouts in the 1890s. Brower post office was established December 20, 1889, with Robert C. Bell first postmaster. The office was closed December 22, 1896. 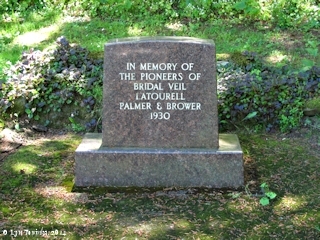 ... "
Click image to enlarge Pioneer Memorial Marker, Guy W. Talbot State Park, Lower section, Latourell, Oregon. Image taken June 30, 2014. The small community of Palmer was located one and one-half miles south of the community of Bridal Veil, and was a saw-mill and logging town for the Bridal Veil Lumbering Company. Palmer was located up Bridal Veil Canyon, on Bridal Veil Creek and was connected to Bridal Veil by Palmer Mill Road and a two-mile, wooden, v-shaped flume. Timber was rough-cut and then flumed down the mountain to the planing mill at Bridal Veil. The Palmer Post Office was in service from 1898 to 1919 with Idona Pulley being the first Postmaster. The Post Office was located near the mill and logging railroad of the Bridal Veil Lumbering Company. 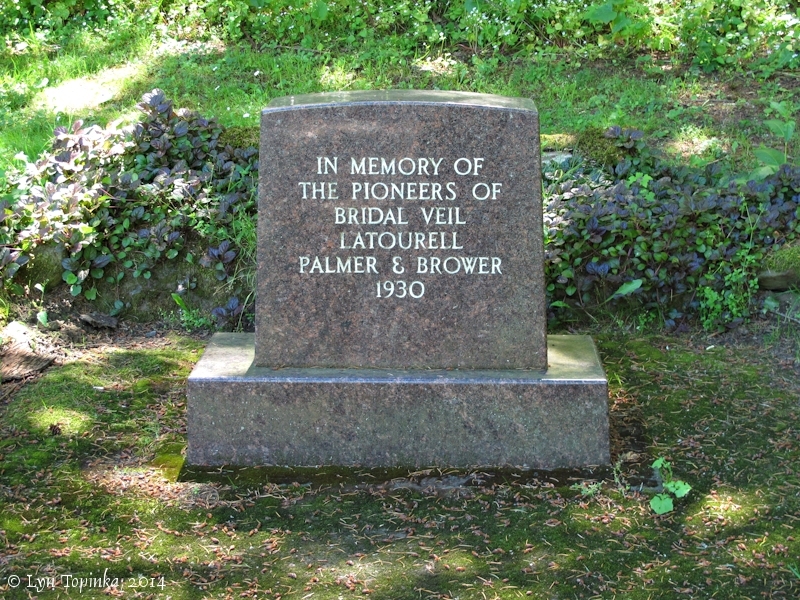 According to Oregon Geographic Names (McArthur and McArthur, 2003, Oregon Historical Society Press), Palmer and Palmer Mill were named after Loren C. Palmer, president of the Bridal Veil Lumbering Company. 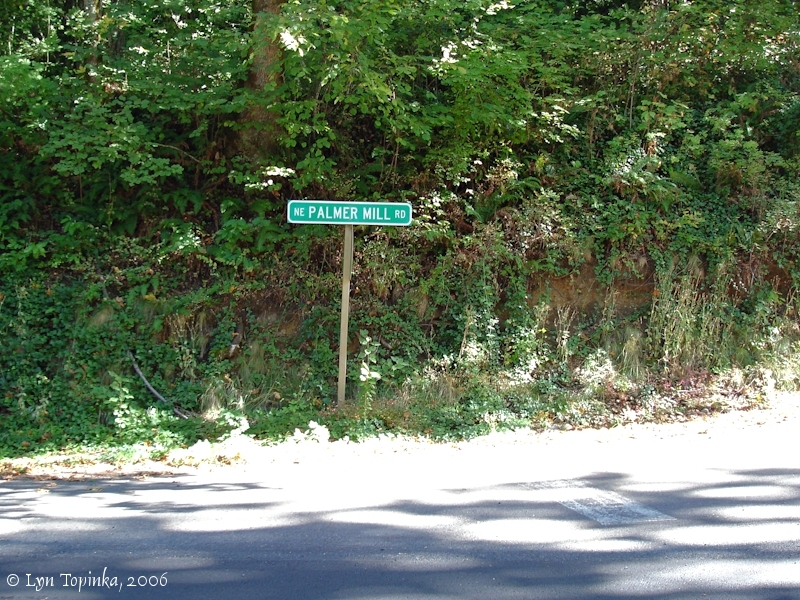 Other internet sources however have quoted information from Oregon Post Offices, 1847-1982 (Helbock, R.W., 1982) saying Palmer and Palmer Mill were named after Bertha Palmer who was appointed Postmaster in September 1899. "Bridal Veil evolved as a company mill town in the 1880s when one of Oregon's first paper mills was established on Bridal Veil Creek. A small community developed around the papermaking mill for the families of the workers. It was followed by the Bridal Veil Falls Lumbering Company that consisted of a logging operation and saw-mill on Larch Mountain, and a planing mill at Bridal Veil. In 1886, the Company started construction of the mill buildings and residential dwellings east of the paper mill. A saw-mill and logging town, later known as Palmer, was built one and one-half miles south of Bridal Veil on Larch Mountain. It was located up Bridal Veil Canyon, on Bridal Veil Creek and was connected to Bridal Veil by Palmer Mill Road and a two-mile, wooden, v-shaped flume. Timber was rough-cut and then flumed down the mountain to the planing mill at Bridal Veil. The Bridal Veil and Palmer communities and mills worked in tandem, dependent upon each other, for nearly fifty years until fire destroyed some of the planing mill buildings at Bridal Veil in 1936. As the timber supply on the mountain was nearly depleted, and the country was in The Depression, a decision not to rebuild those buildings was made. In 1937, the mill buildings and town were sold to "Wood Specialties Company", later named "Bridal Veil Lumber and Box Company". This company produced wooden cheese boxes for the Kraft Food Company. Ammunition boxes for the Army and Navy were manufactured during the war years. In 1950, the Company decided to diversify and began producing molding, doorjambs and window frames. By 1960 the Company had ceased operations. Bridal Veil's nearly 75-year history as a company mill town came to an end." Source: Tom Cowling, 2001, "Stories of Bridal Veil, A Company Mill Town, 1886-1960", produced for Crown Point Country Historical Society, and published by Stuart F. Cooper Company, L.A., Calfornia.